Derived from the Native American word for “The Place of Happy Hearts,” Wayanda references this site’s historic use as a burial ground. This park is one of many throughout the city that once served as potters’ fields. Washington Square Park, Union Square, and J.J. Walker Park all served as cemeteries for paupers, drifters, criminals, and others who were refused burial in “white” cemeteries. A description of Wayanda Park from 1872 said it was “desolate…with no tombstones,” a fact that led later neighborhood residents to appeal for a new park on the site. This request was approved by the Board of Estimate in 1908. The Jameco, or Yamecah, Native Americans, a tribe of the Algonquin nation, originally occupied the land. Known as Little Plains during colonial times and Brushville during the early 18th century, Queens Village was named such by the Long Island Rail Road in 1923 to differentiate the stop from the surrounding county. During this time the area also saw a housing boom as hundreds of new houses emerged, creating the residential style that remains in the neighborhood today. Wayanda Park is bounded by Hollis Avenue, Robard Lane, and P.S. 34 in Queens Village. The Town of Jamaica acquired the site on July 13, 1844, and it became part of Greater New York when the five boroughs consolidated on January 1, 1898. 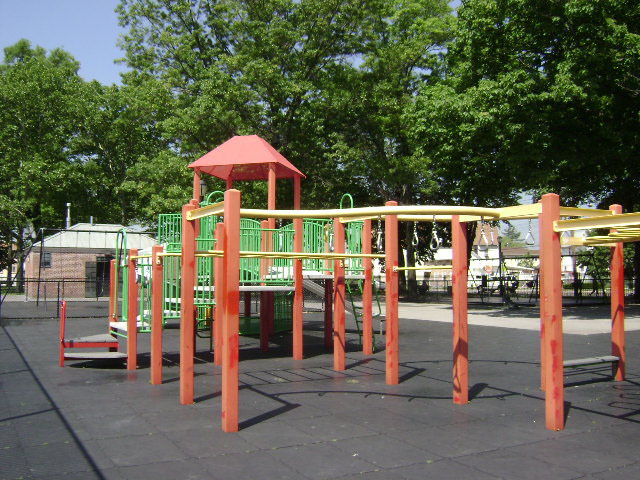 The Board of Education and Parks agreed to a jointly-operated playground for P.S. 34 on December 14, 1911. The site was known as Pauper Burial Ground until 1912 when the first Queens Parks Commissioner, W.G. Eliot, changed it to Wayanda Park. The park opened in 1912 with tennis courts, a flagpole, grass plots, and benches. In 1950, Parks Commissioner Robert Moses (1888-1981) renovated of the park with construction of a comfort station, sand pits, handball courts, a softball field, and play equipment. A mini-school was placed on part of the land in 1970 and still stands there today. Council Member Archie Spigner allocated $412,000 for a reconstruction of the comfort station that was completed on July 28, 1999. Today, the park features basketball courts, game tables, benches, a drinking fountain, handball courts, swings for kids, and timberform play structures and play equipment with safety surfacing. The steel, granite, and bronze flagpole, designed by Robert von Ezdorf, was given as a gift to the school in 1993.